Hövding — a Swedish company best known for its radical airbag cycling helmets (definitely check these out) — is currently crowdsourcing unsafe conditions and cyclist frustration in London. 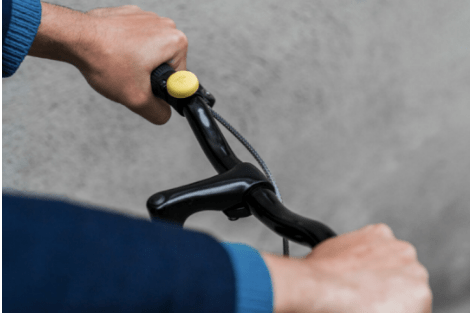 Working with the London Cyclist Campaign, they distributed 500 yellow handlebar buttons. Cyclists were then instructed to tap these buttons whenever they felt unsafe or frustrated with current cycling conditions. 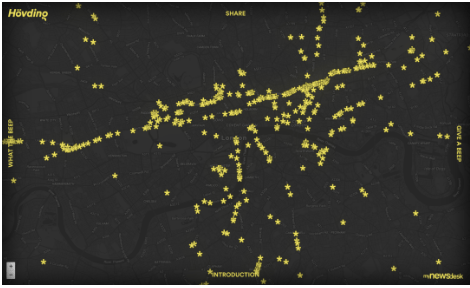 Every time the button is hit, the data point gets logged to a public map and an email gets sent to the Mayor of London reminding him of his promises around cycling. Both of these things happen via the rider’s smartphone. Not only does it tell you pain point locations, but it also seems to suggest the primary cycling routes. I think this is a brilliant initiative because, it’s entirely user-centric. It’s telling you how people feel on the ground. It will be interesting to see if the feedback from the bells can be channeled productively. Is there enough detail in that map to be useful to bike planners? Elsewhere on the Network today: Biking Toronto relays some dispatches from local street safety advocacy efforts — Mayor John Tory is responding to families of people killed by traffic violence who have demanded reforms. The Transportist looks at how new transportation and communications technologies may lead to more sprawl. And The Dirt recaps a speech from Andrés Duany at the Congress for New Urbanism conference last week about how the promise of the suburbs — being close to nature and moving about freely in a car — has fallen short.